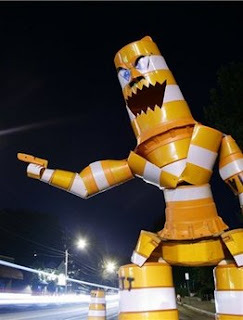 A May 31, 2009 handout photo released by Joseph Carnevale shows a sculpture made of traffic barrels by Carnevale in Raleigh, N.C.. Carnevale says he didn't have a grandiose point to make when he chopped up orange-and-white traffic barrels and turned them into a massive statue of a hitchhiking roadside monster. But the North Carolina college student has become a celebrity artist of sorts since city police charged him with possession of stolen goods. And now, the construction company whose barrels he took wants to keep the statue.